Press Release and review of the C2C 2013 READ! Country superstars are joining forces for the first time in London to create C2C: Country to Country. Some of the biggest names in the business are heading across the Atlantic for a huge two-day music festival extravaganza at The O2 London in March 2013. 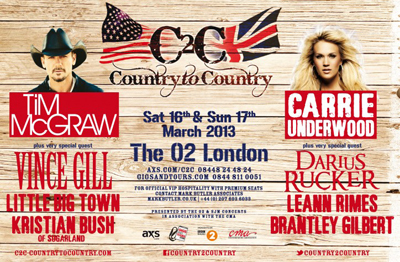 On Saturday 16th and Sunday 17th March 2013, C2C: Country to Country will see a line up of some of the leading country music artists in the world on stage together, including Tim McGraw, Carrie Underwood, Darius Rucker, Vince Gill, Little Big Town, Brantley Gilbert, Kristian Bush, LeAnn Rimes and others to be announced shortly. The sound of Nashville at the world’s most popular venue marks a major milestone in the UK’s love of country, where major US artists sell out arenas around the country. The likes of LeAnn Rimes and Carrie Underwood have had a massive effect on both the UK and US charts by appealing to modern day listeners while echoing the traditional sounds of the greatest country singers. Carrie Underwood’s sell out London performance last summer was the latest milestone and illustrated the UK’s huge appetite for the new sounds of country. The O2 and SJM Concerts in association with the Country Music Association have established C2C with the intention of it becoming an annual event. Jay Marciano, President and CEO of AEG Europe said: “As The O2 is the world’s most popular venue, the creation of C2C: Country to Country, will allow us to continue to maintain that position; our focus is to bring new and exciting events to UK music fans. SJM Concerts and The O2 have jointly created this festival which we anticipate will become a sought after annual event. C2C: Country to Country will cater to the thousands of country music fans in the UK who want to experience some of the biggest names in country music all in one place." Speaking about the forthcoming event, Tim said: "Our trip to the UK and playing The O2 is one of the things I'm looking forward to the most for next year," said McGraw. "I love being able to take my music to other countries, and I think there are a lot of new songs on TWO LANES OF FREEDOM that fans over there will really dig. It's going to be a blast!" Headlining on Sunday 17th will be Carrie Underwood, with 15 million album sales worldwide and five Grammy Awards. Carrie has transcended expectations and the country music genre like no other, and her musical vital statistics are astonishing. Carrie, who sold out London’s Royal Albert Hall in record time this summer, said, "I love the idea of a country music festival in London and I'm so excited that so many amazing artists are coming together for Country to Country. I feel honored to help represent country music, and I know it's going to be a really fun weekend!" As part of a new, recently launched initiative, CMA is investing in an international Country Music industry education and awareness strategy. CMA’s partnership with C2C: County to Country is an exciting platform to showcase some of the most popular artists in the format. CMA will bring the power of extensive assets to help promote the event worldwide. Website features with C2C: Country to Country artist interviews, social posts and digital content are just a few of the ways that Country Music Association’s fan base will be engaged. Steve Moore, CEO of CMA said: “We at CMA are thrilled to be involved with the Country to Country music festival at The O2 arena. It will prove to be the beginning of an annual music tradition that Nashville artists can perform and build new fans throughout the UK and Europe." BBC Radio 2 is the official radio partner, with Bob Harris, King of all things country, supporting the event and will be broadcasting highlights. Bob said: "It's fantastic to see such a great line-up of major Nashville talent performing in the UK. There's a very vibrant music scene in Nashville at the moment and it feels like a particularly exciting time for country music. I'm so pleased that British audiences are being given the opportunity to see some of country music's greatest stars performing live, and am personally thrilled to be able to reflect such a great weekend of music on my Radio 2 country show." 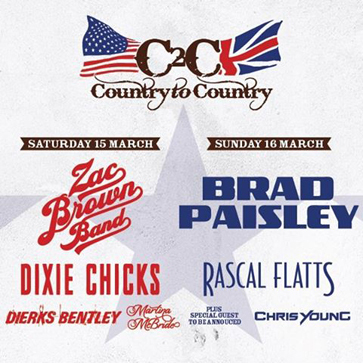 Taking place at The O2, the world’s leading music venue, C2C: Country to Country will be a festival platform to bring country music headliners together in one place, for one weekend. Much more than just a music festival it will be a celebration of country style and culture and will see The O2 transformed into a mini Nashville. 2 - Review of C2C Country 2 Country 2013 at O2 London, U.K.
Don't worry about the rain, because the splendid dome above the 02 London protects you, covering all the activities around the venue. This concept is unique. The host of the event is BBC Radio 2 presenter Bob Harris, who was awarded the 2012 Wesley Rose International Media Achievement Award by the CMA on the red carpet last year by Little Big Town. Bob Harris hosts a weekly one hour show on the network and this program is the only one to offer country music in the mainstream media in the U.K.. The main shows began at 5 PM but the three pop-up stages, booths, restaurants and other interests were accessible at midday for the public. To Start this inaugural edition of the Country to Country Festival, London welcomed the first solo performance of Kristian Bush, the half of Sugarland, and the back up band was folk duet Larkin Poe. Bush is a very respected songwriter and offered his first single "Love or money". His music is a mix of modern folk and country music, and the mandolin was there in a perfect way to enhance the performance. Good start for dancing, playing "Baby girl", the first song he wrote with Jennifer Nettles for Sugarland, and also "Atlantic City" from Bruce Springsteen who is certainly at the top of his list regarding songwriters. Kristian Bush was also a participant in the CMA Songwriters Series which takes places in London, Paris and other European cities at that period, and he offered a free download of the single. First international performance outside the USA for Little Big Town, and the band got a very warm welcome at the 02 London promoting their latest album "Tornado" and several other hits including "Little white church", "Sober", "Fine line", "Pontoon" and an awesome cover of Fleetwood Mac's "The chain". Little Big Town is known as being inspired by the Eagles and Mick Fleetwood's band, and the public waited for them and did enjoy, because they are not only four distinctive voices who may harmonize in a beautiful way, but also combine an experience in backgrounds which represents the best in music. Kimberly offered "Can't go back" and Karen presented Lady Gaga's "Born this way" explaining what banjo means in country! The most long career at the event is definitely the one from Vince Gill who played here with top Nashville session players. That means that if the line-up of C2C 2013 is in the modern area of the Nashville sound, Vince Gill has a long career. But, Vince Gill always looks young and even if he is not at that moment in the current charts, his talents were very appreciated by the audience. As a great singer, and a very respected guitarist, he reaches the young crowd. The set list included "Little Liza Jane", "What the cowgirls do", 'Go rest high on that mountain" and the more recent "Guitar slinger". Vince Gill mentioned Eric Clapton as the reference for him, and introducing his band, I note the presence of David Hungate, who was a member of the rock band Toto from 1977 to 82. Headlining the first Country to Country Festival is Tim McGraw and a very solid performance to end this special day. The multi-awards entertainer is at home on stage and his show was a blast! There is a real communion between the star and his public, and he is the kind of artist who never hesitate to leave the stage to touch hands of the crowd. Even taking time to do a photo with a mother and her little girl. That's the kind of thing which reaches the heart of everyone in the arena, and Tim McGraw, as Carrie Underwood on sunday night, had 1 hour and a half to explore his career. From the classics "Down on the farm", "Everywhere", "I like it, I love it" to several songs from his latest CD "Two lines of freedom", the impact of each hit is so emotional and the perfect quality of the sound at the 02 is a major element in the performance. If the saturday began in the modern folk vein, sunday started with a rebel inflected set performed by Brantley Gilbert. The artist is known for his songwriting, penning "Dirt road anthem" for Jason Aldean. We may think he was afraid not be understood by the public, because he apologizes for his accent. But no probem with that, and Brantley Gilbert offered southern rock mood and was certainly the most tattooed artist of the two-days event. He sung his older songs and the newest including "Country must be country wide". Brantley Gilbert also did his versions of two hits he wrote for Jason Aldean, "Dirt road anthem" and "My kinda party". Time to welcome LeAnn Rimes and her country groove with songs like "Can't fight the moonlight", "Nothin' 'about love makes sense", "One way ticket", and the most romantic with "How do I live" and "I need you". "Blue", "Swingin'" and "Nothin' better to do" were also in the list, and her new single "Borrowed" which also means the end of a six year absence from the recording process. LeAnn Rimes new album "Spitfire" will be released on april 30, and during the singing of "Borrowed", some tears appeared after the crowd reacts with a standing ovation. She did a cover of Janis Joplin's "Summertime" and offered an amazing "Amazing grace" to end her show. The next performer comes from the pop music scene, being the ex-leader of Hootie & The Blowfish. Darius Rucker now continues a solo career with his own sound in country music. He combines country, soul, raggae, rock and has found his public. The British fans remember him openning for Brad Paisley here a couple of years ago. He performed "Alright", "Wagon wheels", "Don't think I don't think about it", "It won't be like this for long", all hits which invite the crowd to dance. Darius Rucker sings "True believers" a song dedicated to the highways, and the title track of his next CD to be released on may 21. He takes time to bring some covers, the Steve Miller Band's "The joker"and Hank Williams's "Family tradition". A moment of surprise came when he explained a wish he had, but hesitated to do it, and his drummer convinced him to realize it. Darius Rucker loves the song "Purple rain" but thought it was not done for a country crowd. So, he performed the hit from Prince here and everyone applauded. There was a huge screen in the back of the scene and two other video screen on each side of the stage. The first one displayed pictures, documents and segments from music videos in relation with each performers, and the ones beside the stage showed plans of the artists during their shows. So, that was the occasion to see the black cadillacs which symbolize the beautiful music video from Carrie Underwood who had the role to close the sunday and the Country to Country 2013 by the same occasion. The second concert in London for the star, and also a combination of old and new songs, from "Some hearts", "Jesus takes the wheel", "I told you so" (her duet with Randy Travis), "All American girl", "Cowboy Casanova", "Good girl" and "Undo it". "Two black cadillacs" from the "Blown away" album will stay in the memory of the fans there. "Temporary home" and the very fun "Quitter" completed the long list of strong hits of her career. Carrie Underwood also rocked the stage with the guitarists and all the arena was involved in the show! For C2C 2014, an early reservation is proposed for a temporary period at the same price than this year. So, you may buy tickets on gigandtours.com and axs.com. Thanks for reading the HighwayFM.com coverage and see you in London in 2014.